The Lorentz transformations apply to matter waves as a Doppler effect. Nothing else. Nothing more. Using Lorentz's swapped x, x' and t, t' variables, the computer will simply produce a Doppler effect. It turns out that x and x' variables stand for the electron axial wavelength. Not space. Similarly, t and t' variables stand for the electron wave period. Not time. 1 – Distances along the displacement axis contract. 2 – All phenomena occur with a slower rate of time. Clocks indicate slower hours. 3 – A time shift appears between the front and the rear. Woldemar Voigt elaborated the original formulas in 1887 in order to compensate the Doppler effect. But Lorentz rather used them to explain Michelson's interferometer contraction. Matter really transforms according to the Lorentz transformations because matter waves are involved. It turns out that Lorentz was right in 1904. This is of the utmost importance. Lorentz was not aware of the wave nature of matter, so he could not explain why such a contraction should occur. But today scientists know that matter exhibits wave properties. So they should reconsider Lorentz's theory. They should admit that their knowledge about the true nature of matter and forces, such as magnetic fields, is quite uncertain. They should temper their unexplainable, actually inadmissible certitude about the non-existence of aether. Lorentz also showed that, in this example, clocks slow down to half of their original rate according to the same contraction factor. This means that a moving stopwatch would run only from 0 to 30 slower seconds while another one at rest with respect to aether would display the time from 0 to 60 seconds. Thanks to beta and g, Lorentz's equations become much simpler. Except for a k constant, those formulas are equivalent to Woldemar Voigt's, which he proposed in 1887 in order to compensate the Doppler effect on Maxwell's equations. In 1895, Lorentz and Poincare were looking for the correct value for Voigt's constant. Any value could explain why Michelson's interferometer did not reveal any change, but just one contraction rate and time shift could prevent a moving observer from detecting his motion through the aether. So their goal was to elaborate an equation set which could make Maxwell's equations becoming invariant in any moving frame of reference. In his books, Poincaré admits two times that Lorentz found the correct solution using the try and error method well before 1904, but the date remains uncertain. The invariance occurs when Voigt's constant is 1. This explains why this constant could be removed from their equation set. Clearly, considering Voigt's goal, Lorentz's equations were also intended to cancel the Doppler effect on Maxwell's equations. But surprisingly, Lorentz and Poincare rarely (or never?) mention it. This surely explains why the Lorentz transformations were no longer linked to the Doppler effect. Lorentz's initial goal was to obtain the correct interferometer contraction value, though. Amazingly (but not so surprisingly because of Voigt's original goal), this equation set produces a Doppler effect involving a slower frequency. Please note that the computer program needs the minus sign for the time equation instead of the plus sign. Otherwise, it displays an abnormal Doppler effect. This indicates that Poincare's version with the plus sign instead of Lorentz's negative one is preferable, but his x' equation also with the plus sign then needs additional interpretation. Actually, the problem was to match Maxwell's equations, but this is no longer relevant here. Finally, the truth about Lorentz's equations. Please read this carefully, because it is of the utmost importance. Fortunately, it is simple and anybody can check that Einstein's version of Relativity is needlessly complex and dogmatic. Lorentz's version is much better because it also explains the way matter behaves. The effects are important, but one also needs to understand the causes. 1. If t = 0, Lorentz's first equation simplifies to x' = g x. This indicates Michelson's interferometer undergoes a contraction according to Lorentz's shrinking factor. FitzGerald and Larmor also proposed this clear, simple, and brilliant idea. So why not admit that moving matter may really contract? However, this does not explain all. 2. If x = 0, Lorentz's first equation simplifies to x' = beta * t.
This means that x' = 0 becomes x' = beta if t = 1. One does not need an equation to understand this: an object which speed is .5 c (beta = .5) will move from x' = 0 to x' = .5 light second in one second. This part of the formula describes the most elementary uniform translation motion along a straight line, also known as the "Galilean transformation". 3. If x = 0, Lorentz's time equation simplifies to t' = g t.
Lorentz was very clear on this: in a moving frame of reference, phenomena occur with a slower rate of time, hence moving clocks indicate slower hours in accordance with g. It should be emphasized that the time itself is not involved. Matter mechanics simply work slower at very high speed because the electron frequency slows down. 4. If t = 0, Lorentz's time equation simplifies to t' = –beta * x. This means that when t = 0 and x = 1, hence where x' = g x = g, a moving clock will display a –beta time shift with respect to another one placed at x' = 0. The more a clock is far away in front of another one, the more it is late. This is what Lorentz and Poincare called "local hours", but it is also a phase shift. In the image below, please observe the way transverse waves are tilted (the system is moving towards the right). Their origin on the concave emitter is not simultaneous and this clearly indicates the phase shift. The videos below also show that Michelson's interferometer contraction is consistent with a 90° reflection. This experience was conducted thanks to Philippe Delmotte and Jocelyn Marcotte's algorithms. Their computerized medium is an effective virtual laboratory. Such proofs were not available around 1900, but today they clearly indicate that a contraction really occurs. Michelson's beam splitter must contract in order to reflect the light beam to a correct 90° angle. Thanks to today's computers, Lorentz's contraction and time shift appear more and more probable. A moving observer cannot detect those transformations. Lorentz explained that a moving observer was himself undergoing those transformations in such a way that he could not detect his motion any more. In addition, he sees unmoving material bodies undergoing a contraction even if they are actually longer. So, because everybody seem to be at rest from his own point of view, even the observer perfectly at rest with respect to the aether cannot know it for sure any more. This reciprocity leads to Poincare's Relativity Principle. Unfortunately, Henri Poincare did not admit that matter really contracts the way Lorentz explained. He spoke about a strange "coup de pouce", an unexplainable "helpful hand" from nature. Finally, his clinging to the idea that any frame of reference is valid without any preference was also adopted by Albert Einstein. This was a huge mistake because the reference to the aether was at the basis of Lorentz's calculus. Nonetheless, while doubting aether, Poincare wrote: "All happens as if aether exists, and this hypothesis is convenient in order to explain phenomena". Voigt's reversed equations with k = 1 produces Lorentz's Doppler effect, which involves a slower frequency. One rather obtains the regular Doppler effect without any frequency shift if k = g. Actually, Voigt's constant adds a variable frequency shift which secondary effect is an adjustable wavelength contraction or expansion. Fortunately, I could recover Voigt's equations thanks to my computer and the very effective try-and-error method. It was a time consuming duty because Voigt used complex and weird archaic notation. In addition, Lorentz and Poincare's first version with a "l" constant was somewhat different and misleading, and Poincare used only the positive sign while Lorentz used only the negative one. Because it is important, I made a gif image from Poincare's 1901 book, where we find Voigt's "l" useless constant still present. Then one realizes that there was a long way to finding Lorentz's Doppler equations starting from the Voigt's ones. The main problem was Voigt's l constant position in the time formula shown above. Both x' and t' equations show the same kl multiplication (k and l stand for g and k below using more recent notation). Because the time formula below rather uses the division gt/k and yet produces a perfect Doppler effect, it becomes obvious that there was a serious anomaly; but it could still have been just a question of interpretation in order to match Maxwell's equation. The Woldemar Voigt reversed transformations produce a variable Doppler effect. If k = 1, it can be removed from the set. One obtains Lorentz's reversed Doppler equations shown above, which involve a slower frequency and the correct axial contraction without any transverse one. If k = g, there is no frequency shift and the result is the normal Doppler effect, which involves a transverse wavelength contraction according to g. This k * g = g ^ 2 version (Poincare's famous aberration squared) could be called the Michelson transformations because it is consistent with his 1887 calculus. One should also compare with Ivanov's transformations (1981) which are wrong because they coincide with incorrect Michelson's calculus. Mr. Ivanov nevertheless performed two brilliant steps towards the truth: he discovered standing wave contraction and matter contraction as a result. In this case, the time (more exactly the phase) equation simplifies to: t' = t – beta * x, hence t' = t if x = 0, which means no "time dilation". The space (more exactly the axial wavelength) equation simplifies to: x' = x g ^ 2 + beta * t. It is a very convenient way to obtain the normal Doppler effect. I am rather surprised that nobody ever used this method instead of the complex relative Doppler equation below, where theta is the angle of a given x', y' moving point with respect to a moving emitter. Most reports about Michelson's experiment never refer to this formula. This is weird because it quickly indicates a wavelength contraction according to Lorentz's g factor for a 90° angle. It rather indicates an on-axis g squared contraction on a go and return trip (0° and 180°). This calculus is much simpler that Michelson's and the resulting "aberration" alone explains Michelson's goal to detect aether by means of an interferometer. However, Michelson's 1887 calculus was wrong because he did not take the frequency shift into account, and he was not aware that his interferometer would transform either. It turns out that the Lorentz transformations are just a Doppler effect involving a slower frequency. Here is a program showing this. You may press A, B, C or D in order to change the constant value. The absence of transverse contraction is obvious for Lorentz's k = 1 version, and one can also notice that the frequency slows down. 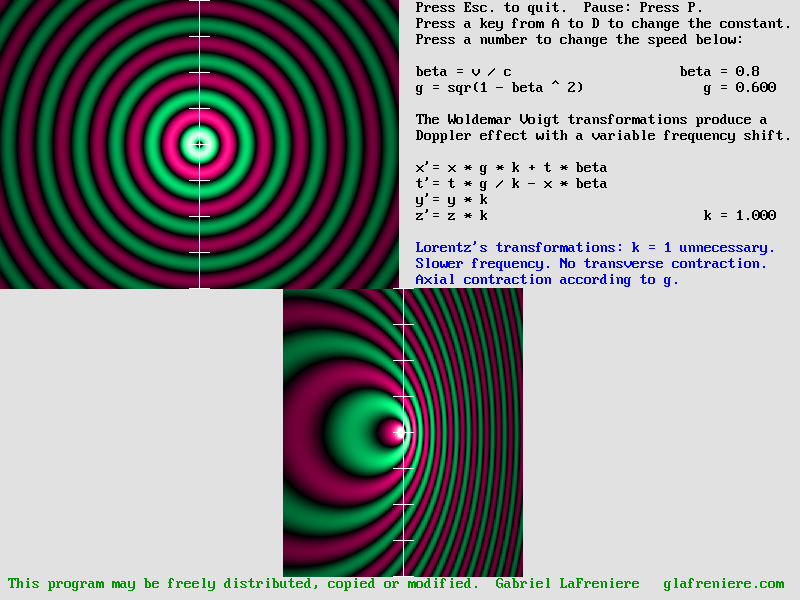 Please check in the source code that the program really uses Voigt's Doppler equations. A screenshot from the program. Please check that the transverse wavelength remains unchanged. The regular Doppler effect rather produces a transverse wavelength contraction according to g.
Isn't this a shame? Lorentz himself would be horrified. What is more, I cannot edit the text because I am considered a "heretic". Fortunately, it is likely to change because computers cannot handle so inane ideas. If you are a pro in computer programming, you surely can check this. You will finally admit that Lorentz was right about matter contraction, simply because we know today that matter exhibits wave properties. So moving matter should exhibit Doppler properties. Unfortunately, Lorentz changed his mind later because he could not explain matter contraction, and also because of Einstein's celebrity. But today he would certainly agree with the Doppler hypothesis. Lorentz wrote that his equations apply to electrons. He was also aware that Voigt created the first version in order to cancel the Doppler effect. The link between the Doppler effect and the electrons is obvious. It indicates that waves are involved, but this idea had not yet been considered in 1904. However, since de Broglie's discovery, scientists made many experiments (the electronic microscope is a good example) showing that the electron exhibits wave properties. In such a case, the electron waves should undergo the Doppler effect. In addition, because Relativity has been verified so many times, its frequency should slow down at very high speed. This is the most important point: the electron frequency slows down according to Lorentz's factor. In such a case, the axial wavelength contracts according to the same factor and there is no transverse wavelength contraction any more. This explains why y' = y and z' = z. Scientists know that the electron alone is responsible for molecular binding, hence for matter construction, ant it surely performs this in accordance with its wavelength. So all the rest follows as a consequence. The electron frequency slows down according to Lorentz's factor. This phenomenon alone causes the Lorentz transformations and explains Relativity. Henri Poincaré discovered that a clock located in the front of a moving system would be late as compared to another one at the rear. Lorentz was aware of an uncertain time shift well before because of Voigt's 1887 equations, but he published the correct equations only in 1904. This can be calculated in a simple way but one must be extremely careful, though. Let's consider two observers moving at 86.6% of the speed of light. Their true distance is .5 light second and they have elaborated a procedure in order to synchronize their clocks. One of them must emit a radio signal at 0 hour according to his own convention and the other one accepts to synchronize his clock on this signal upon reception plus the delay because of the distance. According to Relativity, they will both think that they are at rest, but they will also be fooled for three more reasons. Firstly, the speed of light as compared to their frame of reference is 1 – beta forward and 1 + beta backward. Secondly, their clocks are ticking slower. And thirdly, using a radar, they will find a longer distance between them: exactly one light second, and so they will add one second to compensate the delay. The time shift for t = 0 and x = 1, hence x' = g = .5 in this example is given by Lorentz's Doppler time equation shown above. The best way to be sure is to verify: so you should make the calculus by yourself. Surprisingly, it yields the same time shift whatever the direction of the radio signal: it equals –.866 second or –beta for x = 1 and x' = .5, which is the true distance (at rest, the x distance would be 1 light second). This is what clocks really display, but one must bear in mind that those seconds are two times slower. The next page shows that all those effects can be easily reproduced and predicted using a scanner. The Time Scanner (one of my own many inventions, March 2004) proves to be very useful and reliable in order to demonstrate waves' behavior, hence matter contraction and Relativity. The Time Scanner produces a Doppler effect. The slower frequency is obvious because transverse wavelength does not change. The print speed is slower than the scan speed, so the final image is contracted. And because the left part of the image is more recent, scanned clocks also display a time shift. Those effects are fully consistent with the Lorentz transformations. In this video, the Scanner cancels the Doppler effect, so it is consistent with Lorentz's original equations. However, it can also produce a Doppler effect if the scanning direction (or that of the emitter) is reversed. In addition, the time shift is actually a phase shift which becomes well visible if the emitter is a hoop. Then the emission process is not simultaneous everywhere: it begins in the rear, and the phenomenon is especially amazing. Reversing the scan direction reverses the results the same way Henri Poincaré found for Lorentz's equations (see also below). Because the original x and t variables actually are identical to x' and t' in Lorentz's reversed Doppler equations shown above, the reversed direction can rather produce a Doppler effect, a contraction, a time shift and a time dilation instead of correcting them. Scientists should admit that my Time Scanner is a very effective tool for explaining Relativity. Their response up to now is frankly deceiving, especially because it can simultaneously handle variable speed and direction, even transverse and oblique ones. It even respects the law of speed addition. Lorentz's equations are much less polyvalent. The Time Scanner can handle multiple transformations simultaneously. It actually transforms the whole frame of reference to another one which speed is different. As a matter of fact, the symmetry is based on Lorentz's Doppler effect, which is perfectly symmetric. The frames of reference are not. One is at rest, the other one is moving. This situation is not reversible. Thus, instead of fiddling with space and time without any reference to the aether, one must rather use the equation set which indicates matter contraction, time shift, and slower hours. This equation set is reversible as well because Lorentz's Doppler effect is. Please note that x = (x' – beta * t) / g is Lorentz's original equation except for swapped x and x' in order to contract matter instead of dilating space. The point is that x and x' variables stand for the electron wavelength; t and t' stand for the electron frequency. The electron is a material entity. It behaves in an absolute way. Additionally, admitting that time units may change is quite reasonable because the electron frequency, which is the time reference, changes according to g. On the contrary, speaking about space and time transformation is frankly unreasonable. 1. Distances are evaluated today according to a given wavelength. 2. Clocks are regulated today according to a given frequency. Ultimately, the wavelength and frequency reference will be that of the electron, whose frequency slows down at high speed in such a way that its transverse wavelength never changes. Transverse distance units remain stable and correct at any speed in spite of the axial contraction. Thus, moving electrons transform only axial distance and time units, not space and time! This diagram shows an arc of a circle with radius is one light-second. It represents a spherical wave. It has been emitted at point C by the mobile emitter which is now located at point B. Beta equals the CB distance. The spherical wavefront has reached points A and D. Waves emitted between C and B are now compressed between B and D as the forward Doppler effect. This is the sag, which is given by: 1 – beta. Finally, Lorentz's g shrinking factor equals the AB distance. The goal is to find simpler equations which only indicate the contraction rate and the time shift. Simpler formulas for contraction and time shift. The t' variable actually stands for a phase shift, which produces a "phase wave". The electron is a spherical standing wave system undergoing the Lorentz transformations. Please observe the phase waves (vertical stripes moving to the right). The incoming and outgoing Doppler effect is also clearly visible. Lorentz's Relativity and the Cartesian frame of reference. Lorentz's equations are using Descartes' well known x, y and z axes. It should be emphasized that Lorentz was also using a transformed Galilean moving frame of reference. For instance, instead of reporting the new x' values inside the original frame, which is at rest inside aether, his x' equation is making a new transformed frame of reference, which is longer (not contracted). Thus any unchanged structure inside such a dilated frame is measured as shorter. This point of view is mathematically acceptable. However, as Lorentz pointed out, this is only a mathematical artifice. The original frame of reference is a Cartesian frame of reference, and even the moving structure should rather be measured with respect to it. Clearly, Lorentz's method is misleading and should be avoided. Einstein and most scientists, especially Minkowski, then admitted such inane ideas as space contraction and time dilation. They even admitted that gravity could bend space and begun to use non Euclidian geometry. However, this does not explain anything. It is even totally absurd. Distances can contract, not space. Clocks can slow down, not time. And gravity is a force, which certainly acts in a mechanical way. Gravity cannot bend space. Consequently, x', y' and z' units in Lorentz's Doppler equations must rather be related to the same Cartesian frame of reference, which is postulated to be at rest with respect to the aether. There is no such thing as a Galilean frame of reference because Galileo's Relativity principle is wrong. One can nonetheless use a moving frame of reference where structures are contracted, but where x' length units are identical to those in the preferred Cartesian frame of reference. One should firstly examine how matter will transform. Then it becomes possible to transfer the values to a moving frame of reference in order to establish the moving observer's illusions when he observes structures in his own moving world as well as structures perfectly at rest. This is the basis of Lorentz's Relativity. Let us consider the following animated diagram. Observer O is on the Earth, which is moving at .866 c toward the right. He is emitting radio signals from Greenwich, UK, indicating the time. The distance between observers A and B is one light second (300 000 kilometers). 1– The relative speed of light on a go and return trip inside this moving system is given by g^2 = .25 between observers A, O and B along the displacement axis. It equals g (not squared) = .5 between O, C and D along any transverse axis. This means that the time needed for a radio or radar signal for a go and return trip will be the same on both axes, so these observers will notice no anomaly. This also explains the Michelson Interferometer's null result, because it should undergo the Lorentz contraction. 2 – The time for a radio or radar signal to perform the round trip will be doubled on both axes. This will be consistent with their clocks running two time slower. So, surprisingly, C and D will estimate correctly their distance because of two opposite errors canceling each other. This will also induce A and B into error because their distance on the displacement axis will seem doubled. 3 – Clocks where A, O, and B are do not indicate the same time, making it impossible for them to notice the difference between the relative speed of light forward and backward. 4 – The Doppler effect on light is not detectable if both the emitter and the receiver are moving at the same speed and in the same direction. The virtual Doppler effect cancels the regular one. 5 – Their ability to detect the contraction is cancelled because their instruments as well as themselves are also contracted. Up to now, nobody could indicate any experience capable of detecting the aether displacement. Finally, moving observers do not know whether they are moving or not. They can always presume that they do not move. This means that an observer truly at rest cannot detect his absence of motion either. This situation leads to Lorentz's Relativity, whose conclusions are similar to Einstein's, but whose postulates are different. Lorentz's 1904 version of Relativity is perfectly true and complete. See "Electromagnetic phenomena in a system moving with any velocity smaller than that of the light. ", Proceedings, Amsterdam Academy, May 27, 1904. Matter really contracts. Facts are absolute. For a given moving entity, there can be only one time, one speed, and one position in the Cartesian frame, which is at rest with respect to the aether. One cannot switch freely from x to x' and from t to t' according to a different moving frame of reference because Galileo's Principle is wrong and because light is a mechanical phenomenon. Lorentz wrote in 1927: "The chief cause of my failure was my clinging to the idea that only the variable t can be considered as the true time and that my local time t' must be regarded as no more than an auxiliary mathematical quantity". Unfortunately, Lorentz's only error was to admit a failure where there was none. It turns out that his 1904 absolute point of view was perfectly correct. The point is: Lorentz's equations involve the speed of light, and the speed of light is absolute. So Poincare's reversed equations and the corresponding version of Relativity, which was also adopted (not to say copied) by Einstein, are wrong. It was a disastrous ideological slip, simply because light and matter do not behave like this. On the one hand, Lorentz's Relativity (those are Poincare's words), which conclusions are much similar to Einstein's Special Relativity, is not a theory any more because it has been verified thousands of times. From its own point of view, any material entity seems at rest, and other entities only act, react and seem to undergo the Lorentz transformations in accordance with their apparent speed. Relativity is all about appearances and illusion. It is not what is really going on, it is just what any moving observer will record. On the other hand, please bear in mind that Lorentz's discovery is much more important than Relativity because it is how matter really acts and reacts. Scientists will finally realize that the Lorentz transformations are a mechanical law of nature, probably the most important of all. So it should be called Lorentz's first law. It should include the mass gain, which is kinetic energy, and was also discovered by Lorentz. Matter axial contraction is caused by the Doppler effect, which transforms its standing waves according to its absolute velocity. Its mechanics work slower and in different times in accordance with the unequal relative wave velocity, and the wave compression causes higher mass, force and energy. It is not an illusion. It is what is really going on. Lorentz's first law was the origin of Poincare's "New Mechanics", which lead to severe changes in Newton's laws. The challenge is to upgrade them by taking the Lorentz transformations into account. On the Internet since September 2002. Last update January 21, 2008.